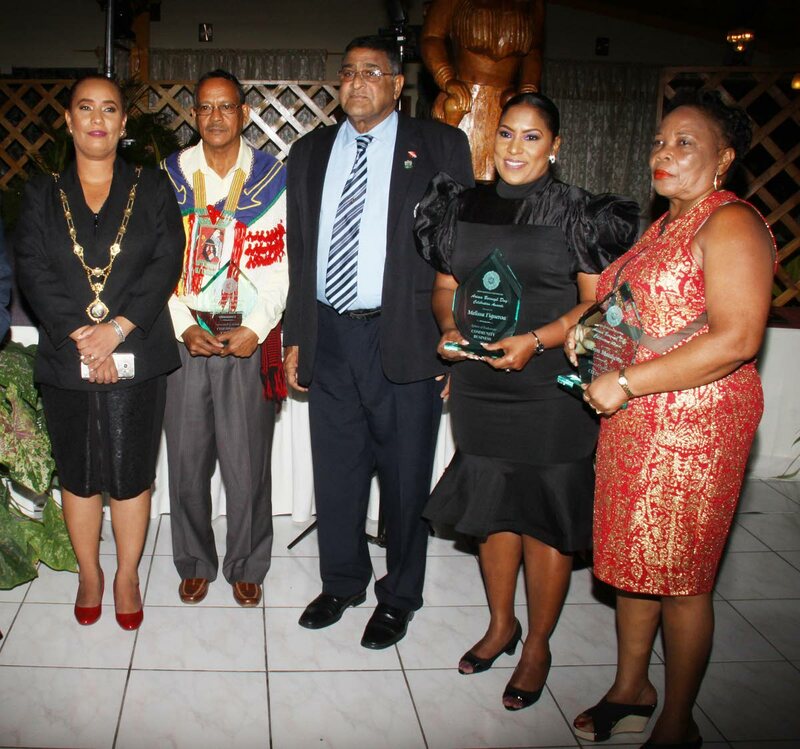 AWARDS TIME: From left, Arima Mayor Lisa Morris-Julien, Carib Chief Ricardo Bharath-Hernandez, Sangre Grande Regional Corporation Chairman Terry Rondon, Melissa Figueroa and Gloria Matthews at the Arima Civic Awards ceremony last week Wednesday. SEVERAL people and groups were highlighted at the Arima Borough Council’s annual civic awards last Wednesday at the Arima New Government Primary School’s auditorium. Among the awardees were Amber Charles, Henry Bernard, Mt Pleasant Mas Committee, David Stephen Sankar, Sumer Edwards-Williams, Arima Business Association President, Reval Chattergoon, Brian Astor, Elma Knights, Annette Lala, Modonna Wheelers Cycling Club, Kwesi Browne, Major Marlon B. Hart, Dr. Gerard M. Antoine and the Arima Police Station. A visibly pregnant Mayor Julian, reminded all that from her first few months in office, Arima was now a zero tolerant zone for illegal vending. She said, “Many of us know and would have see the mayhem at the side of the Arima Market. Somewhere in our pursuits for better market conditions, the lines got crossed and our message faded, while people with agendas decided to push a war against the vendors. She also urged vendors not to be influenced by those whose only agenda is to slow down the building process the Borough is engaging. Reply to "Arima honours its best and brightest"